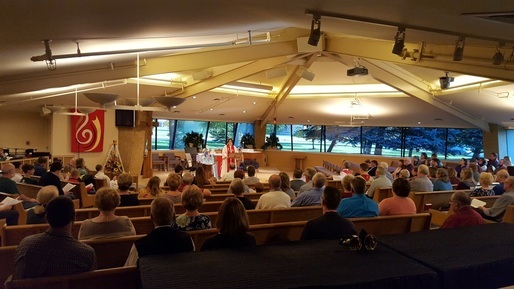 Sermon recordings from Grace Lutheran Church. To listen, click on the icon or choose "download"
​Advent began on Sunday November 26th. Advent is the time when Christians prepare their hearts for Christ's coming at Christmas. While the rest of the world jumps right from Thanksgiving to Christmas, Christians take the time to focus on what Christ's coming truly means. ​The gospel reading this Sunday is the Beatitudes- a series of sayings about how people are blessed in mourning, persecution, and other situations we would usually not associate with blessing! Being "blessed" is a popular notion in our culture (it even has its own hashtag!). The sermon will look at what it means to be #blessed and how Biblical blessing is different or the same. ​In my message, this week I am going to spell out what the offerings given by the members of Grace Lutheran do to help us with our ministry here at Grace and also outside the walls of our church. I will share some of the information that will be in the special mailing you will receive next week. We are asking you to consider a generous increase in your giving for 2018. You will get to hear from one of the most generous givers we have at Grace - one of our high school youth! ​In 1 Corinthians 3 the Apostle Paul says he built the church in Corinth as a "skilled master builder" (Greek = "architect") upon the foundation of Jesus Christ. At the end of the Sermon on the Mount Jesus declares that those who hear his word and do his work building their houses upon the solid rock. Our stewardship program this month stresses the solid foundation upon which Grace has been built, as it also calls us to expand upon that foundation by giving more so we can do more to help ministries outside of our congregation. ​​​Throughout this 500th anniversary year of the Protestant Reformation we will have special sermons about Martin Luther's life and teachings. ​Grace is central to Lutheran beliefs. We count on it but it is certainly not fair, It can be tempting to look at others & think beyond God's grace. But the Bible tells us that anybody can turn their life around, ask for God's forgiveness & receive God's grace. ​Judging and forgiving, or not forgiving, affect us all. The Bible is very clear on these two subjects. We are not to judge others and we are to forgive. But, how to do this, is the sticky point. This week I am sharing what the Apostle Paul says about a couple of ways in which members of the early church in Rome were judging others and his guidance from God on how to deal with the situation. I am also dealing with Jesus' "Parable of the Unjust Servant" that lays out why we are to forgive others. There is more good biblical guidance for us all in the texts. ​LAF: Love & Forgiveness - that's what it's all about. Over & over, the Bible points us toward these things. The law is summed up in the command to "Love your neighbor as yourself". In Mathew 18, Jesus lays out how we are to handle conflict where conflict is inevitable & forgiveness is necessary. On a day when we begin our educational year & go out to serve others, it is good to remember these themes. Come to hear how God loves & forgives us & how we can better love & forgive each other. ​None of us knows what the future holds for our lives. We also don't know the good or difficult situations we face, or the people in our lives whom we will love, or with whom we might need to have the courage to forgive. This fact was never more clear than in the story of Joseph and his brothers in the book of Genesis. Joseph faced hardships few of us could imagine, and they were all caused by the sinful actions of his own brothers. Yet, through his faith in God, Joseph was able to learn to forgive and work to restore broken relationships. He gives us all a shining example of the power of forgiveness we can exercise in our own lives. ​​Throughout this 500th anniversary year of the Protestant Reformation we will have special sermons about Martin Luther's life and teachings. ​As summer begins, many of us are preparing to go on vacations, trips & to family reunions....visits to old & new places. Jesus sent his disciples out into the world with some very specific traveling instructions. We'll look at those & what it means for us to go out in the name of Jesus today. What do we take with us when we travel & how does out time away relate to our faith? Pastor Paul will talk about what God does to build up his people as the body of Christ. We celebrate with our confirmands and thank their parents for keeping the promises they made to then at their baptism many years ago. How should Christians act and relate to those in the church and outside of the church? The very first Christians who lived in Jerusalem showed us how to do this. This week's sermon is based upon the "check-list" found in Acts 2. It makes it very clear what you and I are to do to live as those who have been baptized into Christ and saved by Christ. My message has some practical and godly advice and encouragement for us all. ​The story about the "Road to Emmaus" in Luke 24 highlights what the power of the resurrection can do to us. Cleopas and his friend, followers of Jesus, left Jerusalem on Easter morning filled with sadness and dread. Even though they had heard the confusing news of something happening with Jesus' body, they didn't know the truth of Easter. When they met up with the stranger who joined them on the road a deep conversation ensued about Jesus. Only later did they come to see the truth of Easter. Easter is the moment that changes everything. It changed Cleopas and his friend. It changes you and me, as well. This week's sermon is all about the changing power of the resurrection. One of the most powerful demonstrations of God's love that Jesus showed was the way in which he reached out to and welcomed people who were considered sinners or outcasts. From the tax collector Levi to foreigners, the sick, those possessed by evil spirits and even children, Jesus always showed that he chose them for care and compassion. He has chosen you, as well. When we know we are chosen by God we are then freed to choose in ways which honor God and build up our own relationships. This biblical truth is at the heart of this week's sermon. ​This week's message, "Learning to Choose" is based upon the famous words of Joshua to the people of Israel in Joshua 24, "Choose this day whom you will serve". In my sermon I am going to take apart that sentence to show what it says to us about learning to make the right choices in our lives. ​Doing What's Right Is Not Hard... ​Is It? ​Our Bible texts for this week are the stories of Adam and Eve in Genesis 2 and 3 and Jesus' Temptation in Matthew 4. Both deal with making choices. Both are also scenes from our play "Choices" on March 19. Sin tends to be attractive. If that were not the case, why do we sin so much? Doing the right thing, the godly thing, calls for us to make the right choice. This is often the hard choice. This calls for faith and courage; faith and courage to do what God wants, not what we might want. As Christians we need to grow in faith so that we know God's way is the right way, the good way. We need to know that we must follow God's way. Can any lesson in life be more crucial to us and to others? ​The mysterious story of Jesus' Transfiguration is our gospel story for this week. Shortly before Jesus headed to Jerusalem, where he would die, he took three of his disciples with him up a mountain. There his followers experienced an amazing vision, a vision which revealed a glimpse of Jesus' true identity. During his ministry people asked a lot of questions about who Jesus was. The Transfiguration gives a bit of a look at the answer to those questions. My message this week deals with the question, "Who is this guy?" and what that answer means for our faith and lives. ​In today's reading from Deuteronomy, we are called to choose life by loving & obeying God. Much of today's Gospel reading echos portions of the Ten Commandments. Jesus' instructions to the crowd reveal a pattern of behavior that honors both God & thy neighbor, resulting in life & health for the whole community. We, too, are invited to embrace these commandments, not out of fear of retribution but because God has promised that to do so means life for us. The sermon will lay out small decisions we make each day & bigger life decisions & look at God's hope for our choices. ​Our age, like every age, is filled with people who love to show everyone else how smart, wise and insightful they are. Unfortunately, too often this is not done by actually doing things that are smart, wise or insightful, but instead by putting down others whom these people do not consider to be as intelligent as they think they are. The first Christians were ridiculed for believing something as silly as salvation coming through the death and resurrection of Jesus. But those first Christians held fast to their belief that this was true. The Apostle Paul said that he did not preach the gospel of Jesus "in lofty words of wisdom" but with "weakness and in fear and much trembling". Christians today still stand by our faith in Jesus Christ. It's not foolish, we declare. It is the truth and wisdom of God. This week's sermon talks about why be believe this. ​Who are the blessed ones of God? For Micah, they are those who do justice, love kindness & walk humbly with God. For Paul, they are the ones who find wisdom in the weakness of the cross. For Jesus, they are the poor, mourners, the meek, those who hunger for righteousness, the merciful, the pure in heart, the peacemakers. In baptism we find our blessed identity & calling in this counter-cultural way of living & serving. ​Throughout this 500th anniversary year of the Protestant Reformation we will have special sermons about Martin Luther's life and teachings. ​It's a New Year- but every day is a new start for us who are baptized. Jesus set the example for us when he was baptized, and he told us to spread his word and baptize all disciples. But what does it mean for us to be baptized Christians? Why is it important? We'll look at what it means in our lives, and also what Martin Luther had to say about baptism.